Among Selma Liss Blum’s favorite events to attend were graduations, said Stanley Knoll, MD, clinical professor of surgery and medical director of the Office of International Medicine Programs at the George Washington University (GW) School of Medicine and Health Sciences (SMHS), recalling his aunt’s love of higher education. 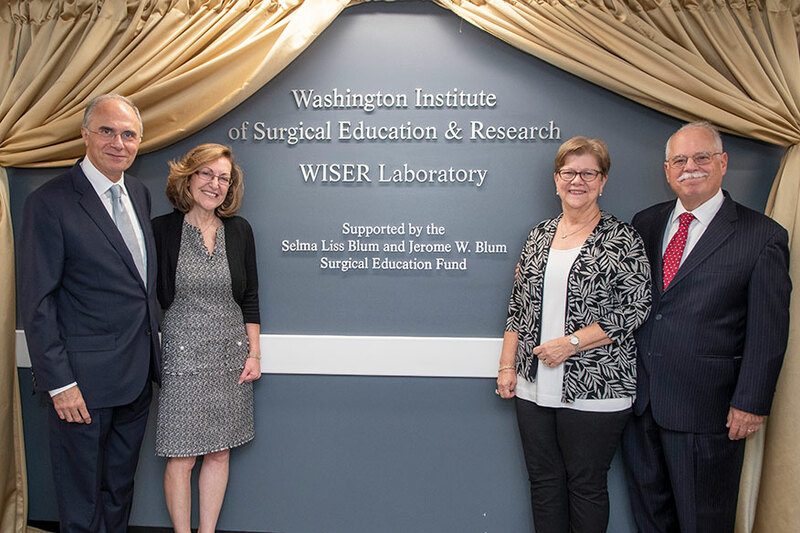 In appreciation for her love of learning, Blum’s family members gathered to celebrate the unveiling of the Selma Liss Blum and Jerome W. Blum Surgical Education Fund. The fund will provide for educational expenses and materials in the GW Department of Surgery, and also includes the Stanley M. Knoll, MD, Endowed Surgical Prize, an annual award for the GW surgery resident who most exemplifies clinical excellence and serves as a role model and leader in the Department of Surgery. The unveiling ceremony started on the third floor of Ross Hall, at the Washington Institute of Surgical Education and Research (WISER) Center. The center is dedicated to surgical education and application of innovative technologies to train surgeons and medical students in the most advanced procedures to provide exceptional patient care. Knoll and his colleagues helped bring the WISER lab to GW in the 1990s, after a trip to Ethicon Inc. headquarters to convince the company to get into the laparoscopic industry. The company founded the WISER lab, and supported its foundation and equipment. Following the unveiling and a tour of the center, family, residents, faculty, and friends gathered for a reception and remarks from Knoll and Anton N. Sidawy, MD, MPH, Lewis B. Saltz Chair of Surgery and professor of surgery at SMHS, as well as a video message from Jeffrey S. Akman, MD ’81, RESD ’85, vice president for health affairs, Walter A. Bloedorn Professor of Administrative Medicine, and dean of SMHS, who was out of the country at the time of the unveiling. Sidawy described one of his first encounters with Knoll, when he, then a resident, scrubbed in on a surgery with the junior attending surgeon. In addition, both Selma and Jerome faced medical hardships, recounted Knoll during the reception. Ulcers led Jerome to undergo a gastrectomy, performed by John Garlock, MD, a famous surgeon at Mount Sinai Hospital. Meanwhile, Selma was seriously injured during a fall and subsequently successfully cared for by a GW surgical alumnus Reza Askari, MD ’00, BA ’96, BS ’96. Gifts to WISER provide support for faculty and student research and travel, graduate student fellowships, and more. If you would like to make a donation, please click here.